Have you visited our Facebook page yet? There, you can get a daily dose of your favorite Shoreline dental team! We post lots of cool content ranging from wacky and fun day celebrations, friendly oral hygiene reminders from our teeth team, star patients, and much more! It makes for a great relationship both in and out office. Did we mention that if you like us, you’ll get a surprise at your next visit?? What’s not to like LOVE?! 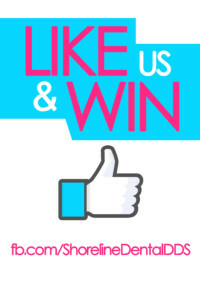 Be apart of our community and LIKE our facebook page to stay tuned!